In this article we will explain what bariatric surgery is and what types of bariatric surgeries are used today. Weight-loss (bariatric) surgery is a lifesaving and life-changing treatment for severely obese patients who have not had success with traditional, medically supervised weight-loss strategies such as diet modification, exercise, and/or medication. It works by physically restricting the amount of food patients can eat and/or by interrupting the digestive process. 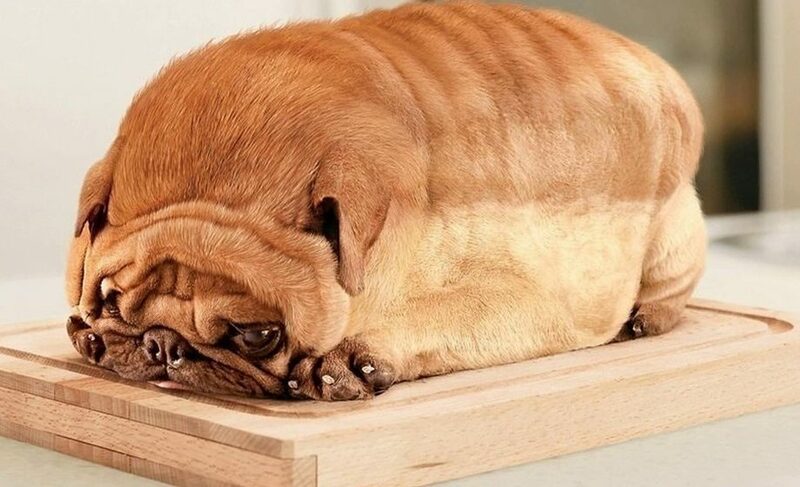 It does not remove fatty tissue. Severe obesity, commonly defined as weight that is at least 100 pounds more than the ideal for age and height, is the second-leading cause of preventable death in the United States. Some 18 million people in the United States suffer from it. 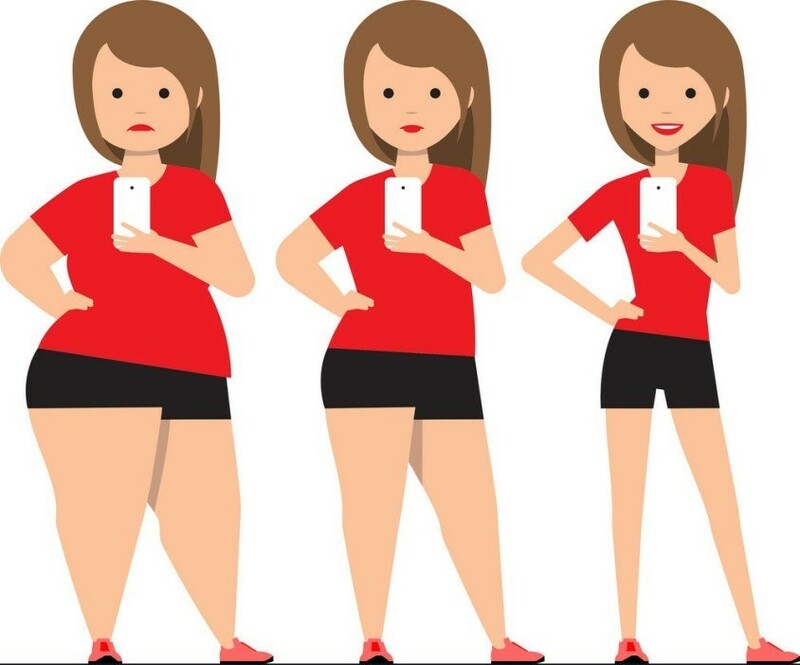 With this condition sharply on the rise in the United States, the number of weight-loss procedures has also jumped, from 16,000 in the early 1990s to 180,000 in 2005, according to the American Society for Bariatric Surgery. We explains when bariatric surgery might be appropriate, what is involved in the procedure, and what to expect immediately after the surgery and in the long term. Bariatric surgery induces weight loss by physically restricting the amount of food patients can eat and/or by interrupting the digestive process. It does not work by removing fatty tissue from the body. • Restrictive surgeries, such as the Lap-Band® procedure, the vertical banded gastroplasty ("stomach stapling"), and the sleeve gastrectomy, physically limit the amount of food a patient can consume by reducing the size of the stomach or the amount it can expand. • Combined procedures, including Roux-en-Y gastric bypass, do the same but also surgically reroute the digestive tract so that food actually bypasses most of the stomach. Combined procedures make up 80 to 85 percent of all bariatric surgeries performed in the United States. • Malabsorptive procedures, such as biliopancreatic diversion bypass, do not affect food intake but instead limit the absorption of calories and nutrients from food by creating a bypass around a significant length of intestine. For very ill obese patients, for whom the restrictive or combined surgeries might be too risky, the procedures are sometimes broken down into two smaller operations. Currently, the vast majority of operations carried out by the method of Laparoscopy . During laparoscopic surgery, a telescope and camera project the image of the patient's organs and the surgical instruments onto a video monitor. Because of the minimally invasive nature of laparoscopic surgery, time in the hospital, postoperative pain, and infection risks are markedly reduced in comparison to open surgery but not entirely eliminated . Approved by the Food and Drug Administration in 2001, the Lap-Band® procedure involves implanting an adjustable band that contains saline solution around the stomach to reduce its size. This surgery is reversible, causing no permanent change in patient anatomy. As the "Lap" part of the name suggests, it is usually performed laparoscopically (through a small incision). In recent years, the Realize Band®, another form of adjustable gastric band, has also been FDA approved for use in the United States. Because the band restricts the amount of food that can be consumed, patients feel full sooner than they did before the procedure. Neither the production of digestive enzymes nor the body's ability to absorb vitamins and nutrients is affected by this surgery. In accordance with the patient's weight loss and wellness goals, the Lap-Band can be loosened or tightened with a needle that increases or decreases the amount of saline solution in the band through a "port" placed underneath the skin during the surgery. These adjustments can be made during regular outpatient physician visits. About a half-dozen adjustments are usually required during the one to two years after surgery and only once or twice a year after that. The Lap-Band procedure is safe for the majority of patients, but, as with any surgery, there are risks. Most of them are not life-threatening. While more than 300,000 Lap-Band procedures have been performed worldwide, the resulting weight loss is usually less significant for these patients than for those who opt for combined surgeries (such as the Roux-en-Y), which both restrict stomach size and disrupt the digestive process. The band can be removed—typically laparoscopically—although experts often recommend leaving it implanted indefinitely in patients who are benefiting from it. Because this procedure is relatively new, data about the effects of long-term implantation are not yet available. 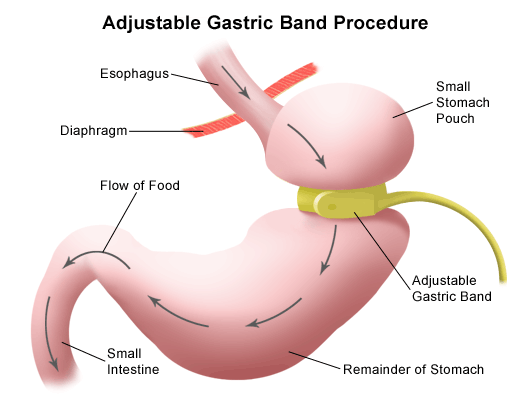 Bariatric surgeons often recommend the Lap-Band procedure for patients who need to lose 50 pounds or less, who do not want a permanent change in their digestive system via surgery, or who are at very high risk from open surgery. A restrictive stapling procedure, the sleeve gastrectomy removes a large portion of the stomach and transforms the shape of the remaining stomach from saclike to narrow and tubular. The surgery often can be performed laparoscopically. A sleeve gastrectomy is frequently advised for patients deemed to be high risk for other types of bariatric surgery or those who are otherwise unable to undergo a laparoscopic procedure for weight loss. 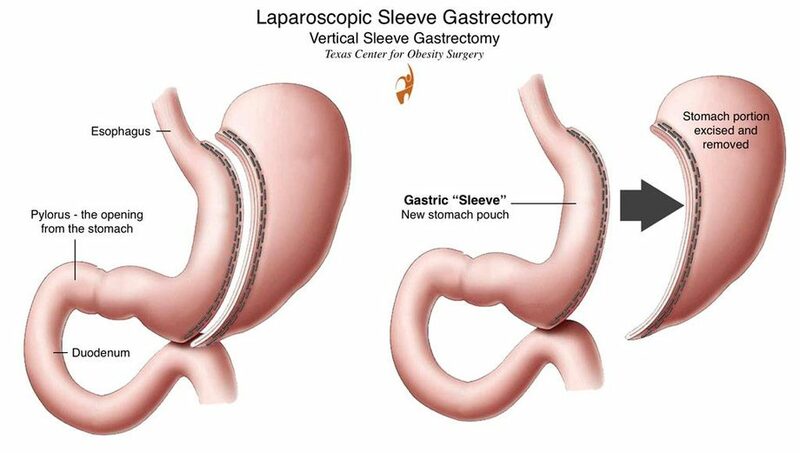 The sleeve gastrectomy is also gaining popularity as a part of a "staged" approach to reducing risk: Very ill obese patients, for whom other restrictive or combined surgeries might be too dangerous, sometimes undergo a sleeve gastrectomy first and then become fit candidates for further weight-loss surgery . Considered the gold standard in weight-loss surgery throughout the medical community, Roux-en-Y gastric bypass surgery has been the most successful surgical procedure for total weight loss and long-term maintenance with the fewest metabolic complications. This combined bariatric procedure restricts the amount of food patients can eat and also alters the digestive process by which calories are absorbed in the intestine. Approximately 170,000 U.S. patients underwent Roux-en-Y gastric bypass surgery in 2005, according to the American Society for Bariatric Surgery. During the procedure—which is often performed laparoscopically—surgeons use approximately 5 percent of a patient's stomach to create a gastric pouch at the bottom of the esophagus. The pouch is connected directly to the middle part of the small intestine, bypassing not only the rest of the stomach but also the upper portion of the intestine, where some of the food's calories are normally absorbed. The result is a "new" stomach about the size of an egg that continues producing the enzymes and juices necessary for digestion. Although patients still absorb most of the vitamins and nutrients from the foods they eat—only iron, calcium, and vitamin B12 typically require post-surgical supplementation—they consume considerably less and typically must eat more slowly, which causes their brains to receive signals of fullness from the gastric pouch sooner than they did prior to the surgery. The Roux-en-Y gastric bypass is safe for most patients, but as with any surgery, there is always a risk of complications. Most of them are not life-threatening. Theoretically, the bypass can be surgically reversed and normal digestive functions restored; however, such reversals are ill-advised because of their high risk. 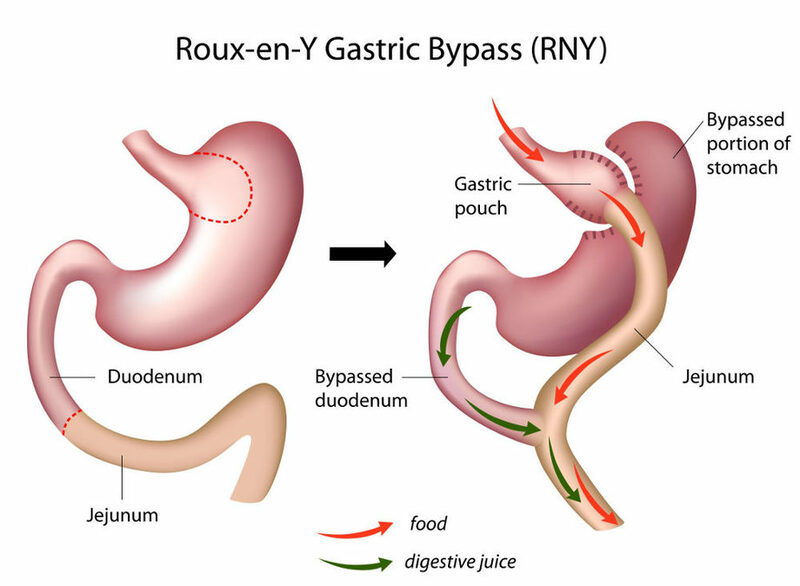 The Roux-en-Y bypass is typically best for patients who need to lose more than 50 pounds and/or those with serious health problems, such as diabetes, that are known to respond rapidly to gastric bypass surgery. The biliopancreatic diversion is a complicated combined procedure that makes up fewer than 3 percent of all bariatric surgeries performed in the United States. 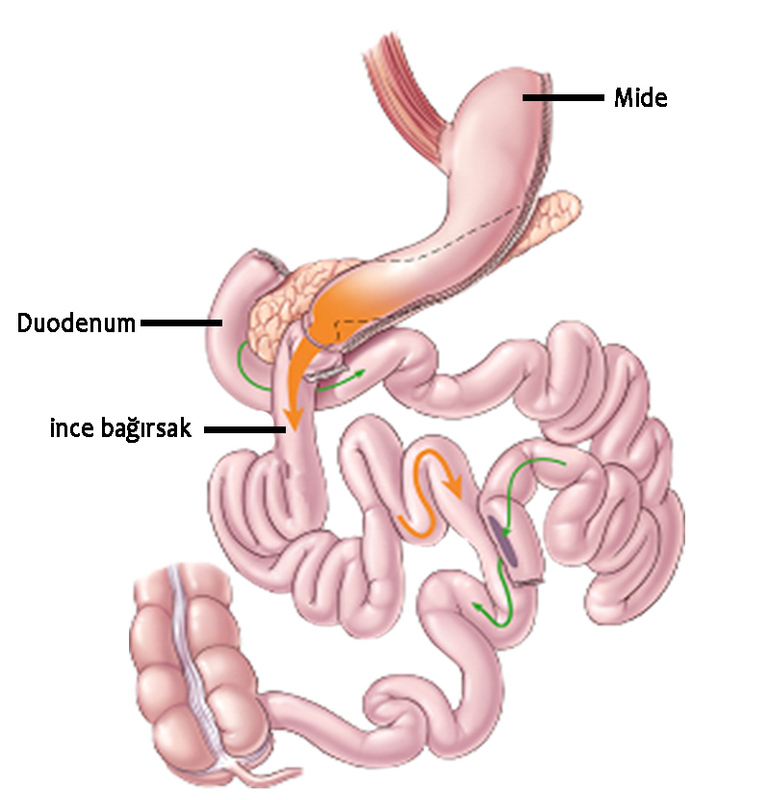 BPD/DS surgery removes the lower section of the stomach, leaving a fairly large stomach pouch that is connected to the bottom part of the small intestine, called the distal ileum. The BPD/DS surgery induces weight loss regardless of the patient's behavior, but the irreversible procedure puts people at a higher risk of serious long-term nutritional deficiencies than other types of bariatric surgeries. This procedure typically is best for patients who need to lose extreme amounts of weight and are committed to long-term follow-up.